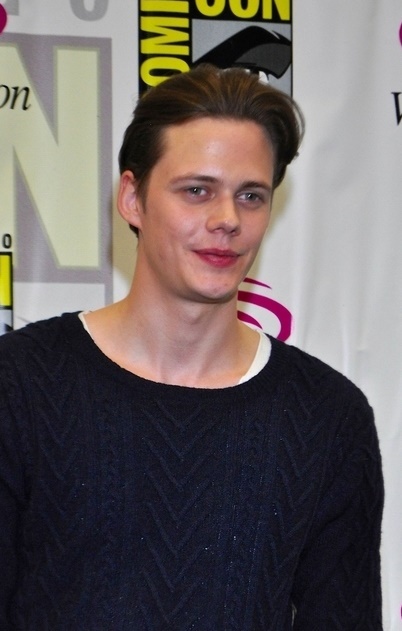 Bill Skarsgård is a Swedish actor and model. He is the son of actor Stellan Skarsgård (Stellan John Skarsgård), and of his wife, My, a physician. Among his siblings are actors Alexander Skarsgård, Gustav Skarsgård, and Valter Skarsgård. His family’s surname was Nilsson several generations back. Bill’s paternal grandfather was Jan Sören Nilsson/Skarsgård (the son of Johan Hjalmar Adactus Nilsson and Ruth Johanna Carlsson). Jan was born in Vasa, Göteborg. Johan was the son of Johan Nilsson and Olivia Augusta Petersson. Ruth was the daughter of Peter Gustaf Carlsson and Constance Matilda Sofia Eugenia Bohmann. Bill’s paternal grandmother is Gudrun Larsson (the daughter of Sigurd Antonius Larsson and Astrid Elisabeth Matilda Bengtsson). Sigurd was the son of Anton Larsson and Anna Sopia Nilsdotter Larsson. Astrid was the daughter of Janne Bengtsson and Julia Andersdotter. Bill’s maternal grandfather was Nils Johan Fredrik Günther/Guenther (the son of Johan Fredrik Wiliam Günther and Anna Ragnhild Amalia Sjöberg). Nils was born in Kalmar län, Kalmar, Stadsförsamling. Bill’s great-grandfather Johan was the son of Johan Fredrik Günther and Selma Lovisa Sandell. Anna was the daughter of August Julius Sjöberg and Nancy Johansson. Bill’s maternal grandmother was Sonja Karin Marianne Svensson (the daughter of Gustaf Albert Svensson and Karin Henrietta Isaksson). Sonja was born in Kalmar län, Dörby. Gustaf was the son of Frans Gustaf Svensson and Hildur Kristina Sofia Andersson/Laestander/Lindqvist. Bill’s great-grandmother Karin was the daughter of Gustaf Henrik Isaksson and Hilda Olivia Stenström. his lips are like Swedish fish!! coincidence I think not. Johan was the son of Johan Nilsson and Olivia Augusta Petersson. Astrid was the son of Janne Bengtsson and Julia Andersdotter. Gustaf was the son of Frans Gustaf Svensson and Hildur Kristina Sofia Andersson/Laestander/Lindqvist. Karin was the daughter of Gustaf Henrik Isaksson and Hilda Olivia Stenström.